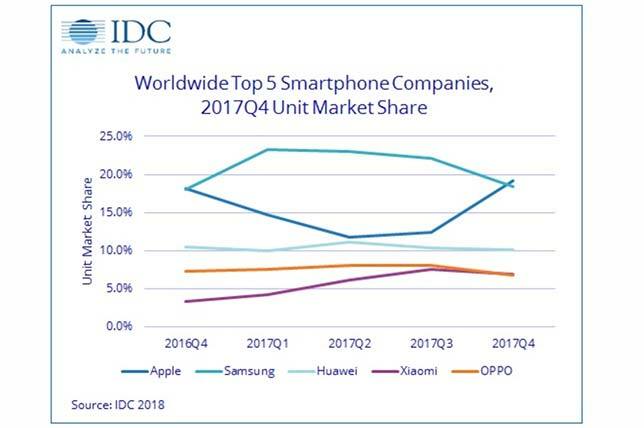 Smartphones dipped in the final quarter of 2017, a period in which Apple re-took the lead over Samsung in worldwide market share. Despite its rise in rankings, Apple's shipments for the quarter actually shrank compared with the same period in 2016, according to preliminary data released by market research firm IDC. Apple shipped 77.3 million Phones in the quarter, a decline of 1.3 percent from the previous year. Samsung, meanwhile, shipped 74.1 million units in the fourth quarter, a drop of 4.4 percent over the previous year. "Apple continues to prove that having numerous models at various price points bodes well for bringing smartphone owners to iOS," IDC noted. "Although demand for the new higher priced iPhone X may not have been as strong as many expected, the overall iPhone lineup appealed to a wider range of consumers in both emerging and developed markets...."
Huawei (41 million units), Xiaomi (28.1 million units) and OPPO (27.4 million units) rounded out the top 5 for the fourth quarter. Overall, the fourth quarter saw a decline of 6.3 percent in smartphone shipments, landing at 403.5 million. For the full year, Samsung remained the No. 1 smartphone maker, shipping 317.3 million phones, up 1.9 percent over 2016. Apple shipped 215.8 million iPhones, up 0.2 percent over 2016. Huawei (153.1 million units), OPPO (111.8 million) and Xiaomi (92.4 million) rounded out the top 5 for the year. According to IDC: "Despite the failure of the Note 7 combined with the endless collective pressure from Chinese players along with Apple, Samsung has managed to remain on top through thick and thin. The pending arrival of their next flagship, the Galaxy S9, may represent the brand's best chance of winning over both new and current customers in 2018."